We speak to the Dutch techno enigma about why the decided to expand his DJ set into full-on live performance. Why was it important to you to develop a live show? "In the past few years DJing has become far more accessible for a lot of people, DJ schools popping up everywhere in major cities and on the internet too. I felt that with the studio nerd that I am, I could do a little extra. Over the course of the past two-and-a-half years I produced about 180 different tracks and snippets, making it fairly easy to drop that into Ableton and start fiddling around with it. I felt that playing live gives another dimension to my work and to me as an artist." "My intention was to create a live set that was versatile, easy to change or improve and not too big in terms of weight or space. As Ableton Live is the heart of my studio it was fairly easy to dive into building something to perform live." "DJing has become far more accessible. I felt that with the studio nerd that I am, I could do a little extra"
"At first I wanted to bounce every track into multiple stems – started with 16 stems and quickly realised that this was out of my control, or I needed an extra set of hands to use all the faders and knobs. Then I decided to divide them into eight different channels, making it easier to control, but then again I felt there wasn’t much to improvise on because I was just mixing one track into another with overlapping elements. But that could also be done by DJing. "I had to find a way in which I could create something really new on stage instead of just playing the music I made in the studio. So I decided to use downscaled versions of my full records in one WAV, taking out some drums and extra synths but having the main sequence and melody running. Those stems are then cut into pieces that can be looped so I can adjust the overall arrangement and cut parts I don’t need live. "Then on stage I take those downscaled versions and try to give them something extra, adding synths from other records, adding live percussion elements and playing extra synth lines with my Moog or a synth plug-in. In this way I’m always sure the mixdown is how I wanted it to be in the studio, and I'm giving the record an extra live dimension by improvising on top of it." 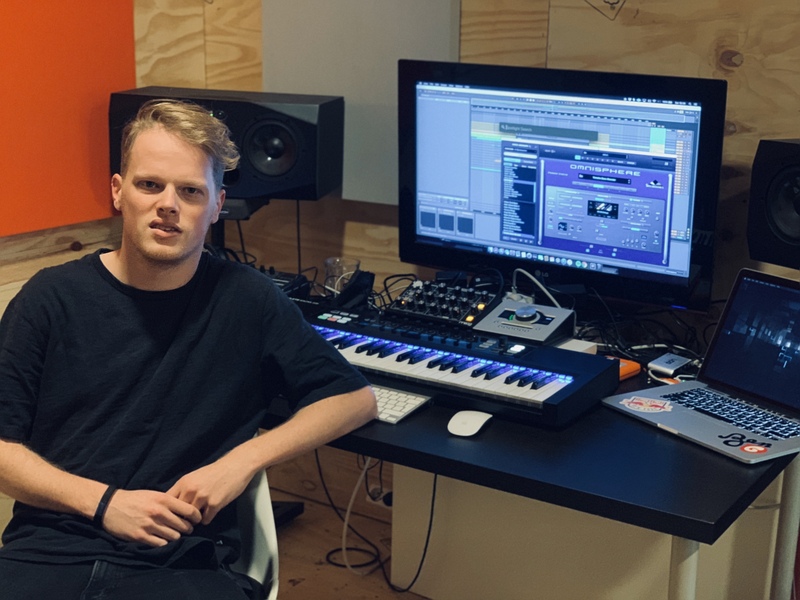 "The Xone’s are mostly there to control levels and FX, I have set up a range of different Ableton Effect Racks with different parameters linked to the knobs on the Xone. The Push is mainly used to sequence drums and launch clips in the Session View. My MacBook runs Ableton and the UAD soundcard, and my Moog is controlled by both MIDI signals from Ableton as well as the little keyboard I bring." What are the main challenges in the setup? "On the performing part I do feel that I can improvise more and get more unique sounds with every set, I guess I'm expanding the live set soon with a sequencer and a synth to get more arps or synth lines running around my set. The setup itself is pretty easy to bring along to basically anywhere, I don’t need too much space and I can still deliver everything I want." "Performing live might be more challenging and confronting than playing music from other people"
"Performing live might be more challenging and confronting than playing music from other people – if a record doesn’t work well with a crowd there is only one person to blame and that's you. I guess a lot of DJs and producers will agree that playing your own records always gives a bit more tension. So my best advice would be to make 100% sure you have enough material or inspiration to fill three hours of set time. You will mostly play one-hour sets but you don’t want every set to be the same and you need to be able to adjust to different crowds or stages in the best possible way." "As I mentioned before, a lot of people are DJs these days and in order to stand out from the crowd you need to have something extra. Also the laptops nowadays have such an amazing amount of processing power that it’s easier to take them with you and be sure it handles all the stress. A few years ago my laptop wouldn’t be able to give me such a complex FX chain on each channel because it would literally just crash." "I’m thinking of getting a Moog Mother32, already in love with the Minitaur, but the Mother32 has a sequencer making it easy to program and use live. The sound is always fat and it’s a compact machine making it easier to travel with than a big synth." Keep up with VNTM on Facebook here. VNTM plays Awakenings New Years Special on Saturday 29th December alongside Sam Pagagnini, Charlotte de Witte, Nina Kraviz and DJ Rush.